The Herkules’ engineering team typically manufactures ball screw systems for use in our scissor lift tables. The ball screw technology works well for a variety of automation applications. It provides the precision needed to move product linearly along an axis. When multiple ball screws are combined traveling along an axis or rotating on a fixed center you have the basis of the multi axis robot. 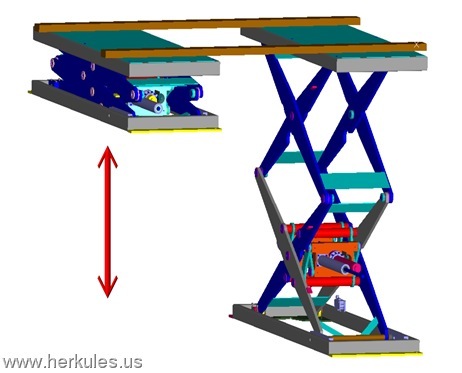 Herkules’ focus is the use of ball screws as a linear actuator within our precision scissor lift tables to create a linear movement along a single axis. 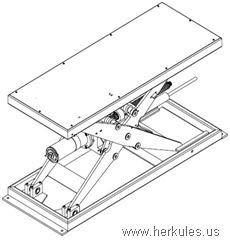 The Herkules’ ball screw scissor lift tables can be mounted in multiple directions. This allows design engineers to use the features of ball screw scissor lift tables to pick and place product in a variety of ways in the automated factory. For example, the ball screw scissor lifts can be mounted from above and lift product up and down with precision with no chance of side movement because of the stability provided by the scissors. The Herkules’ engineering team typically manufactures ACME screw systems for use in our post lifting systems (PLS). This screw technology is ideal for high loads, low pitch with minimal back drive and low duty cycle. High loads can be lifted safely due to our double nut safety system used to attach the carriage which provides a safe, foolproof anti-fall lock. The low pitch screw allows the system to be used in areas of high vibration without concern of drift. The carriage nuts used with our ACME screw systems provide a very low price point. In turn they can generate heat from the frictional forces during repetitive cycling. This feature limits their use to a cost effective low duty cycle system. Servomechanisms that are used in many applications throughout industry also work well with the Herkules scissor lift table screw technology. The typical feed back system used for the servomechanism is a string encoder which attaches to the top and bottom of the scissor lift table. The encoder provides a time based feed back to the computer processor which allows for accurate positioning of the scissor lift tables. It also provides the ability to accelerate and decelerate the velocity which provides a smooth motion control. The use of the servomechanism in scissor lift table screw technology provides for lifting and lowering light loads and heavy loads with speed and accuracy. 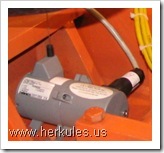 Please contact Herkules at info@herkules.us, or 800-444-4351, if you have an interest in our lift systems. We will be happy to answer any of your questions. This entry was posted in Lift Table Information and tagged Ball Screw & ACME Screw Scissor Lift Table Manufacturer for Industrial Automation by adminenkon. Bookmark the permalink.